Nothing beats the heat from a sunny day like ice cream. The best ice cream (besides Les Artisan de Glaces ~ which is Sorbet anyway) is the Sand Pail Ice Cream Bucket Sundae at Blizzard Beach. It can be found at IC Expeditions at Disney’s Blizzard Beach and Happy Landings and Snack Shack at Disney’s Typhoon Lagoon! For around $10, you get a souvenir sand bucket filled with all your favorite ice cream delights: chocolate and vanilla soft-serve ice cream, waffles cone pieces, Oreo cookie pieces, sprinkles, hot fudge, caramel sauce, strawberry sauce, whipped cream and a cherry. 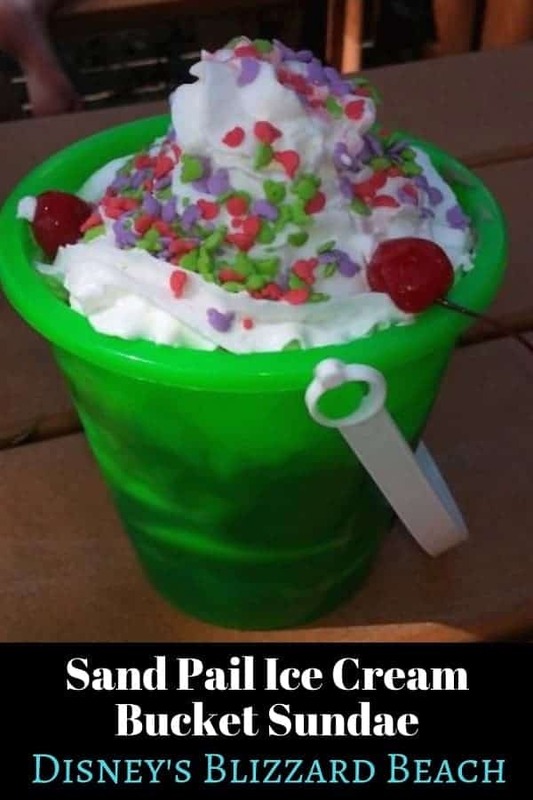 If you dare, you can try to eat the Sand Pail Ice Cream Bucket Sundae on your own, but I would recommend sharing with a friend (or two). Have you had the Sand Pail Ice Cream Bucket Sundae at Blizzard Beach? How many people did you share it with?